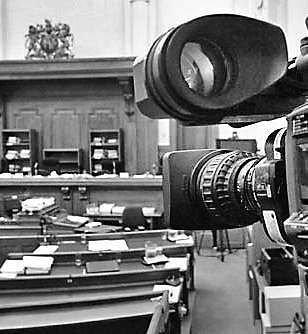 Signalling for a paradigm shift, the Supreme Court on Monday mooted for having audio video recordings of proceedings in the top court and high courts. NEW DELHI: Signalling for a paradigm shift, the Supreme Court on Monday mooted for having audio video recordings of proceedings in the top court and high courts. However, India will not be the first to record trial proceedings; 45 countries, including the US and the UK, already do so. The move can contribute to transparency of court processes by allowing a precise record of the proceedings while discouraging improper conduct in courts and wastage of court time. The system will make witnesses answerable and won’t be able to retract from their statements. If they do, they’ll attract perjury proceedings and also re-recording of witnesses statements often leads to unwarranted delay in trials and adds to the pendency list. On August 14, the apex court had favoured installation of CCTV cameras with audio recording of all court proceedings, including in its own complex along with those of the high courts and tribunals. However, footage of the CCTV camera or the audio recording will not be made available under the RTI Act and not supplied to anyone without permission of the court concerned. The apex court was hearing a plea filed by one Pradyuman Bisht seeking audio and video recording of court proceedings to bring transparency. The move can contribute to transparency of court processes by allowing a precise record of the proceedings while discouraging improper conduct in courts and wastage of court time. The system will make witnesses answerable and they won’t be able to retract from their statements.